The next class is June 7, 8, 9, 10 , 2013.
" The WAFA course was a tremendous learning experience that opened my eyes to new ways of holistic and critical thinking necessary to assess problems, weigh risks/benefits of various actions, and develop plans for backcountry emergency situations. A great balance of theory, practical information, and invaluable simulations and feedback left me feeling more confident and prepared in wilderness settings. The instruction was engaging, informative, fun, and effective – these were quickest 4 days of my life. I would recommend this course to anyone who spends time in the outdoors. " In a matter of a few hours, your 4-wheel drive vehicle can take you far into the outback. So far in fact that calling 911 is not an option. And in the event, you do reach 911, it may be hours before anyone can reach you - not the 3 to 10 minutes we normally expect in the urban environment. In this situation, you need to rely on your own first aid skills learned in the Wilderness Advanced First Aid class. The Wilderness Advanced First Aid clinic will provide you with skills, knowledge and training to handle life threatening medical emergencies and allows you to be better prepared to protect your family in an emergency. Wilderness Advanced First Aid is a four day immersion into general medical concepts and Basic Life Support skills. It’s targeted to the outdoor enthusiast on day trips or short adventures. Taught by professional instructors with significant patient care and backcountry experience. Course materials include a book of lecture handouts, SOAP Notes, The Outward Bound First-Aid Handbook by Jeffrey Isaac, and The Wilderness Medical Associates Field Guide. Wilderness Medicine differs significantly from standard Red Cross courses and other programs that are oriented toward the urban environment. This course teaches what to do with a medical emergency when help is miles away and calling 911 isn’t an option. Students are prepared for emergency situations that involve prolonged patient care, severe environments and improvised equipment. The WAFA clinic includes specific training and certification in Adult CPR and Anaphylaxis management. Successful completion with certification is based on 100% attendance and a grade of 80% or better on final written exam. All students who successfully complete the Wilderness Advanced First Aid course will receive a Wilderness Medical Associates’ WAFA certification card, and Anaphylaxis and Adult CPR certifications cards. These certifications are valid for three years. Students must be at least sixteen years old to participate in this course. Those under eighteen years of age will require the written consent of a parent or guardian. 1. You must be at least 18 years of age on the first day of the course. If you are under 18 years of age but at least 16 years of age on the first day of the course, written proof of parental consent must be provided by the first day of the course. Generally, a high school education or equivalent is necessary to master the knowledge and skills required of wilderness medicine providers. 2. You must be able to communicate orally via radio and telephone. You must have the ability to interpret written, oral, and diagnostic form instructions. You must have the ability to read English language manuals, road maps, and road signs (U.S. courses only). You must have the ability to calculate medication dosages based on body weight/mass. You must have the ability to interview patients, family members, and bystanders. You must have the ability to document all relevant information in the prescribed format. You must have the ability to converse in English with co-workers and other rescue personnel (U.S. courses only). You must be able to perform the physical and diagnostic skills required for the level of certification. This includes determining blood pressure and lung sounds (WFR, WEMT and WALS™ certification levels). 3. You must have the ability to assist in lifting, carrying and balancing a person weighing up to 300 pounds (136 kilograms). You must possess good manual dexterity, with the ability to perform all tasks related to the highest quality patient care. You must have the ability to access another person on uneven terrain; to work in confined spaces; and to withstand extreme environmental conditions. 4. You must have the ability to use good judgment and remain calm in high stress situations. 5. You must successfully complete both written exams and practical skills performance and testing conducted by Wilderness Medical Associates. The class is held at the Hungry Valley State Vehicle Recreation Area (HVSVRA) near Gorman, CA. Hungry Valley SVRA is located in the Tejon Pass about 50 miles north of Los Angeles, CA just west of the Interstate 5 corridor. Hungry Valley has 9 camp grounds each with a multitude of sites. For more information check out their web site Hungry Valley State Vehicular Recreation Area. Lodging is not included in the tuition cost, and you need to make your own arrangements for a motel, a camp site or some cases commuting. There are several motels nearby: a Travel Lodge in Gorman and a Motel 6 and a Holiday Inn Express in Lebec, CA. Lebec is about 2 miles north of Gorman on I-5. You can also use the public camp grounds in Hungry Valley SVRA. 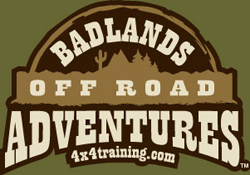 Badlands Off-Road Adventures is the sponsor of this class because we feel anyone who goes into the wilderness needs these skills. The class is run by professional medical instructors from Wilderness Medical Associates, the certifying agency.
" The Wilderness First Aid was one of the MOST USEFULL clinics I have ever attended, due in large part to the effort you and Josh put in to make it all possible. "